Desk-Height Square Bookcase Is Part Of Lorell Essentials Series Laminate Furniture That Offers High-Quality Laminate Construction And A Contemporary Design. Shelves Are Made Of Thick, Medium-Density Fiberboard With Thermally Fused, Mahogany Laminate For Long-Lasting Use. The Visible Backing Behind The Shelves Is Made With 3.18mm Thick, Medium-Density Fiberboard And Matching Laminate. 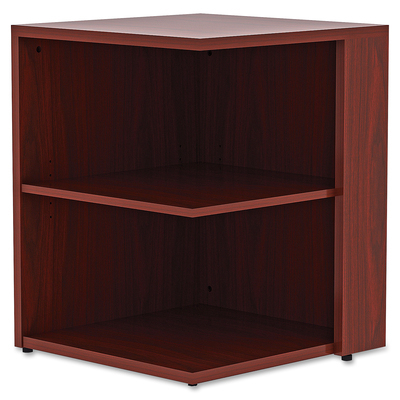 Bookcase Features One Adjustable Shelf And One Fixed Bottom Shelf..
Desk-Height Square Bookcase Is Part Of Lorell Essentials Series Laminate Furniture That Offers High-Quality Laminate Construction And A Contemporary Design. Shelves Are Made Of Thick, Medium-Density Fiberboard With Thermally Fused, Mahogany Laminate For Long-Lasting Use. The Visible Backing Behind The Shelves Is Made With 3.18mm Thick, Medium-Density Fiberboard And Matching Laminate. Bookcase Features One Adjustable Shelf And One Fixed Bottom Shelf.